Welcome to another updating round of the latest news from the online marketing world from last week. Last week, we unearthed Facebook’s secret and murderous plans for Google, MozCast charted the temperature of Mobilegeddon, how Facebook’s latest algorithm updates will be significantly reducing Page reach, and a new research and “influencer search” platform about growing influencer marketing. It seems the social behemoth has its booster on to overtake Google as the second trillion dollar company. Google must die in the process ofcourse. The prospects for this to happen seem to be getting real, especially with the mega trend towards mobile phones, a gradual yet dramatic shift in how people discover (instead of search) news and content, the rise of social video sharing on Facebook, and ofcourse the foreseeable future of social. Read the details about Facebook’s murderous intents at Venture Beat! MozCast — How Hot did Mobilegeddon Get? April 21st just went by, and Google has unleashed its mobile-friendly algorithm in total, labeling and ranking websites according to their mobile responsiveness and friendliness. Google has been trying to make mobile search, and online marketing more relevant and easier to consume and had announced the release of one of its biggest algorithm releases to date. Given all the hysteria over the past few weeks once we learned from Google’s Zineb Ait Bahajji that the update will be bigger than both Panda and Penguin combined, it is time to see what the data has to say about the impact. Moz has been consistently tracking the search engine activity (temperature) over the past week and will be regularly updating the activity at MozCast. Check the Big G’s temperature at MozCast! Facebook recently updated its News Feed algorithms. They will prioritize feeds from friends, and can result in significant decline in brand reach. Facebook is trying to give people what they want: better content from their friends. Facebook knows it will eat up what brands crave: reach and referral traffic. But Facebook wants to be all about the users, and with the rising complaints about users missing feeds and updates from their friends, the social behemoth is alleviating them with its updates. Read the details at Facebook! As marketers, we know how important it is to leverage niche influencers. They have the authority and trust which can dramatically boost our online marketing efforts by magnetizing customers. However, finding the influencers has been a combination of various tools and hours of research. Demographics Pro hopes to reduce the overall effort with its launch of “influence Search”. A dashboard that combines all signals from Instagram, twitter, YouTube to give you the list of the best candidates for getting your message through the sources you are targeting. Learn how you can effectively connect with your target audience with the new integrated dashboard at Search Engine Land! If your online marketing strategy is focused on leveraging the social power of influencers, then recent research has shown how to embrace this form of marketing. Recent research shows that influencer marketing has become the fastest-growing online customer acquisition tactic, beating email, paid, and organic search marketing. Furthermore, research shows that people have come to trust social media stars for recommendations than TV stars. Given that young audiences consumer more social media than television, marketers need to spend more time evaluating and analyzing social media now. More time is devoted to user-generated content and the reports clearly state that it is peer-created and consumer-to-consumer created content that will drive marketing trust rather than the traditional methods of doing the same thing. 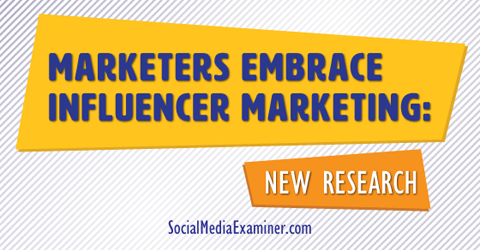 Read the research and report details at Social Media Examiner! This entry was posted in Friday news on 24.04.2015 by admin.